Ostsee-Laender und Inneres Russland bis Moskau. 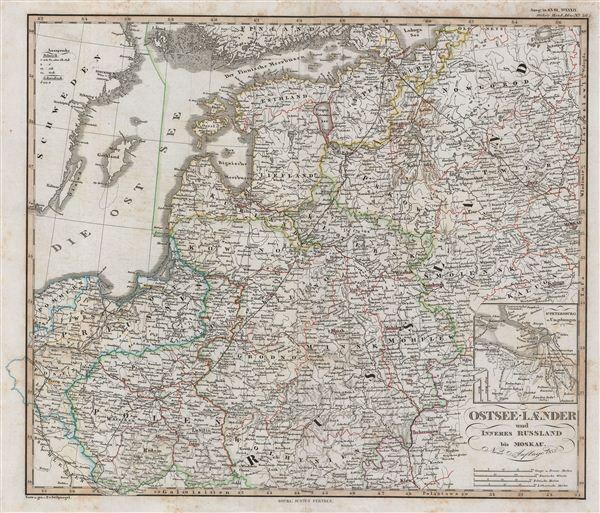 A fascinating example of the 1853 map of the Baltic countries and Russia. The map covers from Sweden and the Baltic Sea to Moscow, including the modern day countries of estonia, Latvia, Lithuania, Belarus, Poland and Ukraine. An inset along the right margin details the environs of St. Petersburg. Russia at this time was under the suzerainty of Tzar Alexander the II. Alexander is best known for his liberal reforms including the emancipation Reform of 1861. The emancipation Reform freed Russia's countless serfs and is considered to be the most important event in 19th century Russian history. Throughout, the map identifies various cities, towns, rivers and assortment of additional topographical details. Political and regional borders are highlighted in outline color. Unlike other cartographic publishers of the period, the Justus Perthes firm, did not transition to lithographic printing techniques. Instead, all of their maps are copper plate engravings and hence offer a level of character and depth of detail that was impossible to find in lithography or wax-process engraving. All text is in German. Issued as plate no. 36 in the 1854 edition of Stieler's Hand-Atlas. Very Good. Moderate overall foxing. Original centerfold. Blank on verso.